At 9.15 in the evening garlanded portrait Sai Baba is reverently carried by the great grandson of Tatya Kote Patil, the son of Baijabai, who used to search for Sai Baba in jungles, and feed Baba, who used to roam about in near by jungles. 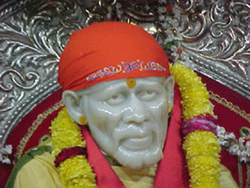 Sai Baba called Baijabai as her sister and Tatya Kote Patil, used to call Sai Baba as Mama, meaning maternal uncle. Also mentioned in Sai Sat Charitra is that Tatya Kote Patil used spend nights in Dwarkamai with Sai Baba and other Devotee Mahlsapati. 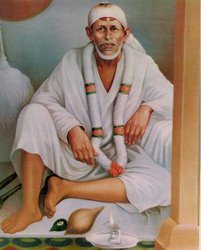 Bhagat Mahlsapati shouted “Ya Sai” (welcome Sai), when Sai Baba first came to Shirdi, with the marriage procession of Chand Patil’s wife’s brother’s son, and alighted at the foot of Banyan tree Khandoba Temple. 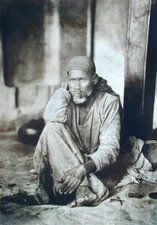 The great grandson of Tatya Kote is preceded by one of the Mandir staff carrying the Satka and the Padukas (footwear of Sai Baba). The procession moves to the Dwarkamai with sounds of drumbeats and other musical instruments, very similar to the description provided in Sai Sat Charitra. In Dwarkamai the Portrait is placed on silver throne and Bhajans are sung in much festive moods for 15 minutes. Then the portrait is again carried in the palanquin and with much music and Bhajans and shouts of victory to Sai, fire crackers bursting. In such festive environment the palanquin is parked outside the Chavadi and the portrait is carried to the silver throne and aarti is performed. 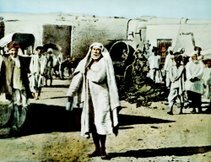 SAI BABA controlled World War I. 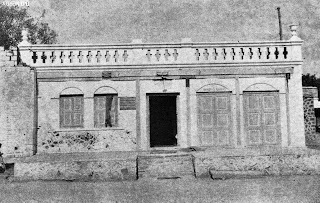 When the Master would come from the mosque to the temple of Gopal Rao, his arti would be sung between these two buildings. At that time, when he was walking between the mosque and temple, a strange light would be seen on his face. It was also noticed that he would make strange signs in the air with his fingers. This behavior continued daily for four years, from the start of World War I to its conclusion. "My light is of God; my religion is Kabiri – Perfect Mastery – and my wealth lies in the blessings I alone can give." "I am the Supreme Soul – the entire creation. I am everything and I am in everyone. "I am formless and I am everywhere. I am not this body you call Sai. "I am in saints, criminals, animals, and everything else ... Nothing happens without my wish. 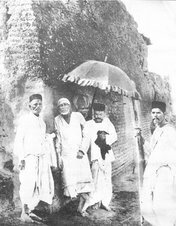 * Sai Baba started sleeping in Chavadi around 1909, when one stormy night it was raining very heavily and the masjid walls were leaking. 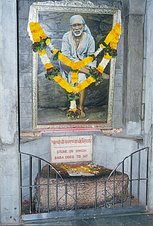 The devotees asked Sai Baba to move in other place, to which He was resistant. 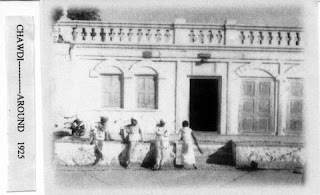 Eventually the devotees virtually forced Sainath Maharaj by half picking him up and carrying him to Chavadi, since then Baba, spent every alternate nights in Chavdi. * Chavadi is also significant as the formal worship of Sai Baba was Started there. 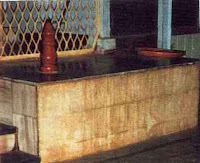 The night Sej arati was started in Chavadi upon arrival of Sai Baba from Dwarkamai and later morning Kakad Arati was offered to Sainath Maharaj when he woke up. As we enter the Chavadi we have the Darshan of the portrait above. 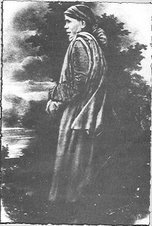 This portrait was painted by a devotee name Ambaram, from a small town Navsari, which is very near to the writers home town Surat. The devotee was blessed by Sai Baba's darshan in dream in 1953, when he was only18 years old. The navsari people being touched by Sai Baba's picture by Ambaram, collected donation, bought the portrait, and brought it to Shirdi. 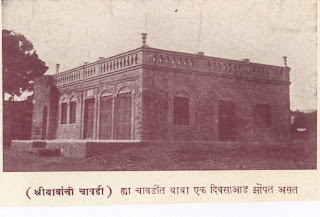 * Right Hand side, where Sai Baba Used to Sleep, he also used to call his Guru's place. Here females were not allowed, that custom is still maintained and only male Devotees can enter this section. Devotees are found bowing in reverence to Sai Baba's Photo, praying, few devotees also sit there and chant Mantras and remember Baba. It has been one of the favorite place of the writer. i spend much time sitting here in silence. The energy level here is really amazing. I have been always asking a question to sai, that during the world war I period you were present why didnt you avoid it. The reply came via the link(Meher baba online) that you provided in this blog spot. "Sai Baba controlled World War 1". Certain things cannot be avoided but baba has taken pains to control it. Yes i went through a similar experience two days ago. 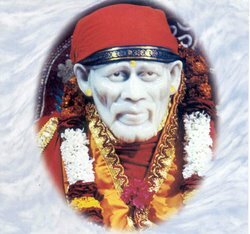 There is a picture of Sai Baba, which is very expressive. The picture looked sad to me and i knew i am about to receive sad news. it happened there are much problems, in a Sai Devotees home, who are closer to me. I was watching Baba's picture and asking him to solve the problem and pleading Baba, to take away the problems. To this the answer came. Baba was telling me, why do I look sad. I look sad because my dear devotees are sad. I am taking their pain. Since i am drawing them to me , and for their ultimate benefit, they have to pass through misery, according to their karmas. I am sad because my devotees are suffering. At the same time I am with them, holding them, supporting them, to help them pass through the necessary karmas. Alpesh, I think you may want to add here that Baba use to sleep in Chavdi on a wooden plank supported by sutli(thin rope) on 4 sides...it was quite surprising a scenario as this rope was thin and worn out and could break too, but it didn't...then, right opposite chawdi is Abdul baba's house...sometimes baba would go there or call abdul baba to read out the Holy Quran to him. and threw it away. But this was in the Masjid and not in Chavadi. 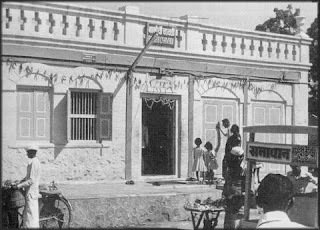 And yes Abdul Baba's cottage will be mentioned under the section homes of devotees which will also cover Laxmibai Sinde's home to whom Baba gave nine coins, just before Mahasamadhi, and also of Bhagat Mahalsapaty's home. I've numerous experiences of Shri Sai Baba to share with my dear Sai devotees. I wrote a book of all my experiences with baba and would like someone to help me out in getting it publish. My name is Pradeep Kumar Kanojia and my contact no. is 9899796055. I reside in Delhi.